This entry was posted on May 19, 2018 by Admin. What’s good people. it’s your boy ChillingWithTJ. 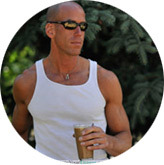 If you don’t know me, I am a YouTube vlogger, I do a lot of fitness stuff (YouTube Channel here). 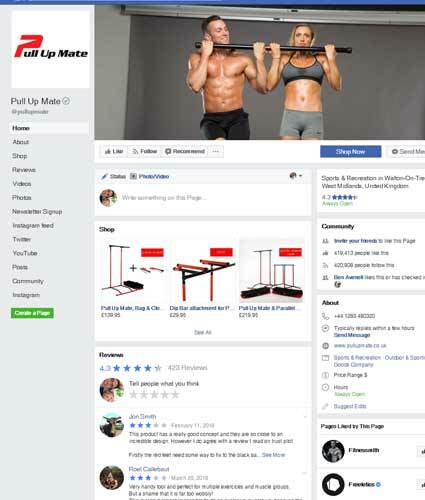 Today, I am going to be showing you a chest and triceps workout using the Pull Up Mate so stay tuned for the rest of the video and hopefully you will enjoy the workout. 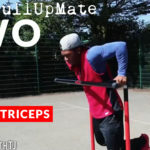 Right, now what we are going to do, as it is meant to be one of the hottest days in Birmingham today (it is a little bit sunny) what we are doing is take the Pull Up Mate and we are going to set up in the park and do a nice outside workout. One of my favorite things to do when it is hot like this, is to enjoy the weather. Obviously I do like going to the actual gym but when it is hot like this, you’ve got to make use of it, and having a machine I can carry out with me is really beneficial. Alright people, right now, we are going to set up now. I decided to do it in the tennis court just because of the nice even surface and my hay fever is acting up, so it made sense. What I am going to do now is to quickly show you how to put it together in a quick motion. It is fairly easy to set up; it normally takes me under 5 minutes. So what I have done is set it up as a dip station and normally, I would add this in if I was doing some sort of pull-up variations. Today, it is going be chest and triceps. First up, what I am going to do is warm up with some dips. I am going to try to go for 3 sets of 8-10. Feel free to do more or less but that is what I am going to go for, for today’s session. For most exercises, it is going to be 8-10 reps. This is what you do; go down- You do not have to go crazy far down, as long your arms virtually get parallel that is as far as you need to go. And also a quick tip is; if you want to lean forward, it is called chest dips and it kind of activates more muscle in your chest. If you lean backwards, then you are working mainly your triceps. So you can do three of each or you can just mix it up. Lean forward, activate your chest, lean back as you do the dips, you feel it way more in your triceps. As I said, it is up to you. You can do chest dips or triceps dips. Ultimately, a great compound move and it is body weight. Alright people, next up, we are going to do some variations of push-ups. What we are going to do is rotate it forward. Alright people, we are going to be doing some decline push up and we are also going to do incline as well. I am going to show you the incline first. I’ve got the machine set it up like this. The good thing about the machine is that those of you have wrist pains when you put your hands flat, you can use the ball, which is more of a neutral grip. Certainly if you have old man wrists like me, hopefully it will help you. I prefer to go fairly low so it is not too high. Then what you got to do is go down. The same with the dips, you don’t have to go crazy, ridiculously low, as long as your arm is parallel, you are doing okay. This predominantly works the lower portion of your chest. So if you want to get those little ‘pecticles’, give this a try. Same thing again, I’m going to go for 8-12 rips. That was 12; it felt pretty easy, so I’m going to go for 20. 20! As well as your decline or incline, there is one variation I forgot to mention which is obviously the flat push-up. You can do it with this machine and still be relatively good on your wrist, because you use this section here. So the same thing again; when it comes to the rep range you can choose whatever you want. The main thing is, if you do 3 sets of whatever rep range you choose make sure you can hit it. So, if you say 3 sets of 10, make sure all 3 sets you can hit 10. But, the very last set should be a struggle, it shouldn’t be easy because that way you know you are actually promoting more muscle growth and actually pushing yourself a lot more. For example, when I did the 10 just, it was really easy so I did 20 instead, so it is up to you. If you find it really easy, feel free to mix it up and try to make it a little bit harder; like I’ll do clap and push-ups. There you go. When it comes to doing some of the exercises though, only do if you are confident. Like the clapping push-ups, if you are not comfortable with push-ups, don’t do that. Be sure to do it when you are ready. Last up for the push-up variations. What we are going to do is the decline. Take care of your machine, don’t just throw it down. At this part, what we are going to do is; we are going to put our feet on here, so your feet are raised up; it helps to activate the upper portion of your chest. And, overall, the best thing when it comes to working your chest is hitting multiple different angles rather than just one position all the time, to stimulate more muscle growth. One of the last things I’m going to show you now for the chest and triceps. Well, this one is basically for triceps. We are going to do a manual skull crusher. In the gym, you would normally get a bar bell or an easy bar and you do that. 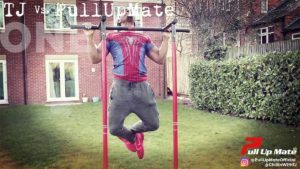 What I am going to do is simulate the same thing while using the Pull Up Mate. Literally, do the exact same thing you would a skull crusher in the gym. You just got to think that you’re in an opposite position to when you’re using a bar. Bearing in mind, this skull crusher is a lot harder than what you do in the gym, purely because this is like a skull crusher mixed in with a plank. You feel a lot more like you core getting activated in the work out. Escalated, it is literally like a plank and skull crusher combined, so it’s a lot harder to do. So when you are setting the rep range for yourself, be generous just for the beginning part. After you get used to doing the exercise then you can improve it. For example, I can probably do 8-10 as my max doing this. So take note of that. Alright people, hopefully you have enjoyed this footage. Quick little work out you can do outside. Very strenuous, as you can see I am taxed. If you try it out, be sure to let me know. But anyways, thanks for watching.